Many co-operatives have provided the driving force in small appellations, but none has achieved quite as much as the group that work together under the banner of Producteurs Plaimont. Gascon to the tip of their berets, they dominate the production of Saint Mont and make a very great deal of wine from the surrounding area too: Madiran, Pacherenc du Vic Bilh and IGP Côtes de Gascogne. White IGP Côtes de Gascogne sells well in Britain. Taste the latest (2013) vintage of ‘Colombelle’ and it’s easy to see why. The blend, featuring mainly Colombard, is as pungent as a Marlborough Sauvignon and just as grassy, with very crisp acidity, palate-cleansing lemony freshness and rather less alcohol than its more expensive southern hemisphere competitor. It’s available in the UK from Nicolas. It is a shame that there’s no UK retail outlet at the moment for the wines of Château Saint Go, one of the four single estate wines made by Plaimont. The light, sandy, gravelly soil on gentle north-facing slopes produces relatively light, perfumed wines, both dry white and red. The 2013 white, a blend in which Gros Manseng has star billing, shows aromatic, herby green fruit, mouth-watering acidity, some leesy complexity and a slightly savoury/mineral finish. In comparison, ‘Les Vignes Retrouvées’ 2012, blended from a number of sites and with a little more Petit Courbu and Arrufiac in the mix, is richer and rounder, with more obvious lees working (neither wine is oaked), but still with pungent grapefruit and herb aromas and a pleasantly bitter, phenolic final twist. It’s a bargain at The Wine Society – just £7.95. The Wine Society also stock the excellent 2010 ‘Empreinte de Saint Mont’ White (£11.50). Altogether more complex than Les Vignes Retrouvées, after a couple more years in the bottle it seems to have put on fat, but has retained its very lively, grapefruit acidity. Complex, leesy and rich it shares the mineral and slightly phenolic finish common to all the Saint Mont dry whites. 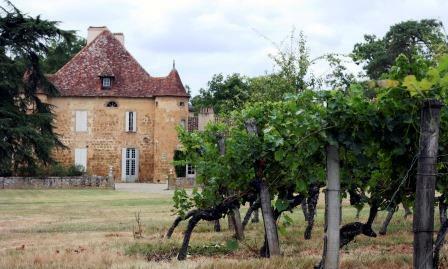 Le Faîte (‘The Pinnacle’) also includes 10% Petit Manseng (with 70% Gros Manseng and 20% Petit Courbu) which has been vinified and aged in small oak barrels. As its name suggests, it is the best of the region, the blend for which is chosen each year by different distinguished ‘godparents’, in this instance Caro Mauer MW and Babette de Rozières. Anything chosen by Caro should be good, as this certainly is, with a fine creamy, complex aroma of green fruits, grapefruit, wild herbs and a suggestion of more exotic fruits. The very crisp acidity balances the creamy texture perfectly. It is also longer than the other dry whites in the Plaimont range. The red Le Faîte 2011, chosen by the same godparents, is a blend of 75% Tannat, 15% Pinenc (Fer Servadou) and 10% Cabernet Sauvignon. It is intensely coloured, complex, with a huge concentration of perfumed black fruit, all underpinned by very fresh acidity and silky but powerful, slightly earthy tannins. The fruit in the mouth suggests elderberry, typical of Tannat, with black cherry and overripe brambles. The most powerful red wine in the Saint Mont firmament is more often than not Monastère de Saint-Mont rather than Le Faîte. Le Monastère is another single vineyard, but in contrast to Saint Go, with a hefty amount of clay in its soil. The 2010 is a huge wine, packed with concentrated, super-ripe flavours of elderberry, prune and cassis. It is even more tannic than Le Faîte, but is also smoothly-textured, rich and long. My note from twelve months ago is almost the same; it seems that Monastère develops slowly and serenely. Le Faîte 2011 is the more elegant, complex wine, Monastère 2010 the more massive and impressive. Château Saint Go 2010 in comparison with both of these concentrated giants is much lighter and more perfumed – the perfume extends to the aftertaste. The oak is a little more noticeable and the structure a little lighter, but it is still a very good drink. Château de Sabazan is another single estate. It is just across the valley to the north-east of Saint Go and on sunnier, south-facing slopes. The soil, a yellow ochre-coloured gritty sand, gives quite perfumed wines with a little more body than at Saint Go, but without the power of Monastère. The 2011 is marked by leafy red fruit aromas. It is more structured and mineral/savoury than Saint Go, rather less silky than Monastère, but is nevertheless elegant and long. Plaimont make three sweet cuvées of Pacherenc du Vic-Bilh. The middle one, ‘St Albert’ is named after the saint whose feast falls at the time of harvest of the raisined Petit Manseng and Gros Manseng grapes from which it is blended, 15 November. The 2012 reminds me of that most 1970s of starter dishes: a grilled grapefruit sprinkled with brown sugar (possibly without a cherry on top). It is fresh, long and very well balanced. This entry was posted on Monday, September 1st, 2014 at 7:57 am	and is filed under South West France. You can follow any responses to this entry through the RSS 2.0 feed. Both comments and pings are currently closed.